Just stop. Your getting on my nerves! Sorry mate, might be a while before I get another 1000, i'm running out of the easy ones! I’d just like to know how you get the time? Two little kids and your still bashing it. Lucky bar steward! I just stream to the laptop while the kids watch Peppa Pig and Mr Bean and all that crap on the TV. If only I could use my laptop. Tommy usually watches you tube on the xbox one and plays roblox on my lappie! Drives me nuts! 1000G on Seasons After Fall, eventually. Got a glitch around 70% completion meaning I had to start again. 1000G Far Cry 5. Not very often I complete a game but well pleased with that one! Great game, thoroughly enjoyed it! Nice, looking forward to playing it. How long mate? Not too bad. I enjoy playing far cry games so couldn’t judge time. 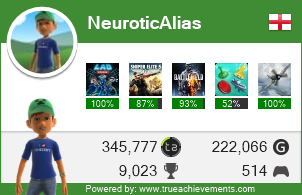 Probably the online achievements took the longest! 1000G on Toby: The Secret Mine, nice little Limbo type game. 1000G on Schrodinger's Cat and the Raiders of the Lost Quark. 1,000 GS on Mad Max...a bit repetitive (especially) with those challenges, but ultimately a good time in small doses. 1000G on Song of the Deep.